So you’ve got vinyl siding and you’d like to attach something to it without causing damage.. well here’s what the experts do! 1. Allow for movement – we cannot stress enough at Ron Ferris & Son you must allow vinyl siding to move because it typically expands and contracts 1/4″ per 12 feet. If you don’t allow vinyl siding to move it will most likely buckle and warp under the pressure. 2. Caulk any holes – if you drill a hole through vinyl siding caulk the hole up with clear silicone or color matched caulking. 3. Use vinyl siding mounting accessories if possible – There are several vinyl siding accessories available. The most common are called J-BLOCKS and they are typically used to mount lights to a wall with vinyl siding on it. Check with your local vinyl siding supplier to see what accessories are available for your specific type of vinyl siding. 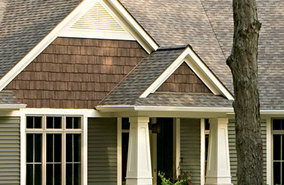 You can also search vinyl siding mounting to find aftermarket solutions. 4. For a custom solution you can remove any give area with a vinyl siding removal tool and mount the item directly to the wall. Then install j-channel around the item and re-install your vinyl siding. At Ron Ferris & Son we strongly recommend you keep a small amount of vinyl siding on hand after your new siding installation. You never know when you may need a piece or two for a repair! For all your siding and roofing needs call us at 585-288-0895 or visit our site @ www.ronferrisandsonroofing.com!